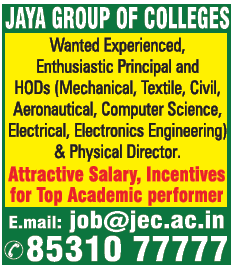 Jaya Group of Colleges, Chennai has advertised in THE HINDU newspaper for recruitment of Principal / HOD / Physical Director jobs vacancies. Interested and eligible job aspirants are requested to apply immediately from 14th April 2019. Check out further more details below. About College: Situated close to Chennai Metropolis, the College is one of the foremost centres of graduate and professional education in the state of Tamil Nadu. The range and depth of resources at the college have few peers. Within easy reach on the same campus and other sites, the college combines all the advantages of a comprehensive institution in the Arts and Science with a full complement of professional schools. Among these are business, dentistry and an unusually complete array of paramedical professions, including pharmacy and physiotherapy. How to Apply: Interested and eligible candidates are requested to submit application along with their CV, copies of certificates and recent PP size photo to the college email address provided here.